Confession time: I skipped the Simon Snow snippets in Fangirl. I didn't care about them. So, you might be wondering, why did I decide to read 522 pages of the stuff? My reason - in Fangirl, I felt like the Simon Snow chapters weren't needed and they took me away from the main story. But here, in its very own book, I was able to enjoy the world of Simon and Baz with no distractions and I gave it the full attention it deserved. And it was awesome. I love Simon and Baz SO MUCH. I've never quite forgiven J.K. Rowling for not putting Harry and Draco together (Drarry FTW) so this book was the next best thing. Seriously, Simon and Baz's relationship is so cute, even when they're trying to kill each other. And I want my own Baz. Where can I get one? As for the writing, it was massively different to Rowell's other books and it didn't have her 'voice'. That's not a bad thing, though - Carry On is still a very, very good book. 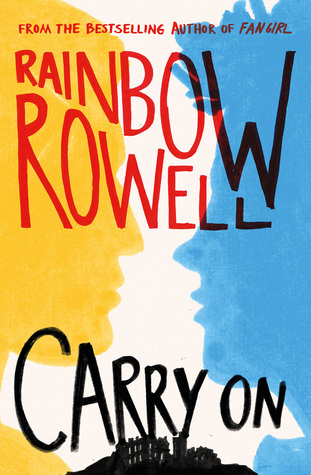 It's a completely different genre, so it was never going to be written in the same vein as Rowell's other books; this is a magical, fantastical, satirical work of awesome set in Watford, after all. Rowell is talented in writing contemporary fiction, and I think Carry On has shown she's even more talented when it comes to fantasy. A few people have said they felt it was slow and difficult to get into, but I was gripped from the beginning - which surprised me, after seeing what everyone else had said. Carry On is a book that doesn't quite take itself seriously, and I love that; it just worked. I spent pretty much an entire day and night reading it, and I've properly missed it since turning the last page! I love all of Rowell's books but this is actually the first one I've given a full five-star rating. Funny, clever and a book that hits the nail on the head when it comes to British culture, Carry On is downright brilliant. All hail Queen Rainbow. so do you mean Simon and Baz are gay?